I hope you are enjoying my new book, A Short Guide to a Long Career, if you haven’t downloaded your free copy, go ahead and do it now. This past July I had the opportunity to go to the first-ever festival for positive education. I believe I was the only dentist in attendance. I got to meet some of the superstars of this burgeoning new field, including Dr. Martin Seligman himself. I came away excited about the future of positive education. I truly believe, as Seligman states, we are looking at a “sea change” in education that will help young people to become the very best versions of themselves. I was excited because this is the heart of what I have been writing about for years. There is no reason that we can’t bring positive psychology principles to dentistry…and medicine. So excited that I enrolled to get my Certification in Positive Psychology. But I digress. This blog post is about the most recent tips that were e-mailed to those who have downloaded A Short Guide to a Long Career. I want to discuss Tips 1 and 2 through the lens of PERMA. The first Tip: Ask Yourself the Big Questions: – Dentists are obsessed with “how” to do things. I’m no different than most – I constantly seek out advice on “how” to do this new procedure or that new technique. The problem is that most of us don’t take the time to answer the bigger questions. Like why we even entered our career (yes, this isn’t restricted to dentistry). That’s a true story. The problem is that it created a lens through which I looked at my entire career. Until I burned out. Then I asked the deeper questions—like what is it besides money, that I need to get from dentistry? I started asking the deeper questions after I was in dentistry for ten years. The answers are still coming. There are plenty of people in dentistry who seem to have the answers – but it’s the ones who have the best questions that interest me more. The biggest question for me is, “how can I reconcile the paradox between duty and desire?” To be a wonderful competent dentist and still create a great life. It’s a paradox we all must answer. Tip 2- Establish Your Role:- Another speaker I heard at the positive psychology meeting was Dr. James Pawelski, the Director of Education at the Positive Psychology Center at University of Pennsylvania. He presented his famous thought experiment that you can see on You Tube if you like – it’s well worth the time. The thought experiment asks us to consider if we were going to be super-heroes, what color cape would you choose to wear? The choices are red and green. He tells us that if you choose the red cape then your role starts out as you having the power to fight against the bad things in our world. That’s pretty powerful in itself. If you choose the green cape you have the power to grow good things in our world. You must choose as part of the thought experiment. I sat there smiling to myself because as a dentist I thought how this fundamental question means so much to the role we play with our patients. Either color works, and Pawelski has some advice (hint-reversible cape?). As I said, it is worth going to YouTube to watch his presentation, but he also claims that the red cape/green cape paradox answers the fundamental principles of positive psychology. The real question for me is: can I flourish and become the best version of myself (and can my patients? )- if I only wear the red cape and put out fires all day. Think about it — Tips 1 and 2 are meant to get you thinking about that long career. Hello again! It has been a long time since my last blog post – and a lot has happened in the world. I promise not to give you any of my political opinions – that would be a short guide to a very short career. In the meantime I want to let you know that the TAO of Dentistry is alive and well. I have been working on a new book project, and it has taken up significant time. I also published my third book, an e-book, that is available for free when you join the Academy of Dental Leadership. The e-book, A Short Guide to a Long Career is also the title of this blog post. For those who have already downloaded the book, I will be discussing the 31 tips that get e-mailed to you every two weeks or so. There is so much packed into that little book that when I re-read it I thought I had so much more to say – and besides I would love to hear from the dental community on how to create a thriving sustainable dental career. I have decided to add commentary to Short Guide to a Long Career, through a series of blog posts beginning with this one. The titles of the post will be numbered to follow the e-mails that subscribers receive. As I mentioned, for the past months I have been writing another book on leadership and communication. I have also furthered my education in Positive Psychology. Those two things have added to my own perspective about creating a long sustainable career in dentistry. Essentially the relatively new field of positive psychology comes down to helping people “live a life worth living.” It is about thriving and flourishing rather than just surviving and languishing. Positive psychologists work in all domains from the military to medicine to education. While studying positive psychology, I couldn’t help but think about the philosophy of Dr. L.D. Pankey. For so many years I referred to what I learned at the Institute as a “philosophy.” That word isn’t very exciting. Dentists would fall asleep whenever I invoked words like “philosophy,” “virtues,” or “Aristotle.” But throughout history from Lao-Tzu and Aristotle to Abraham Maslow and Carl Rogers, it’s truly only been about living a life worth living. The positive psychologists have backed all of the “philosophy and psychological principles” up with real science. In other words – this stuff works–it’s real. 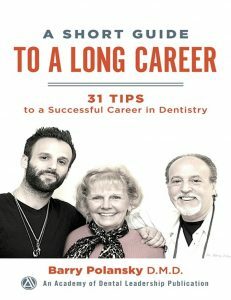 My book is about how to make your career in dentistry worth doing – long term. Download the book…let’s discuss PERMA and well being through the comments below. Let’s also discuss the Commitment Equation. Come on back to the TAO in about 10 days for the discussion of Tip #1.